A 30 day notice is generally offered by a landlord to the tenant when the former wants the latter to leave the property. It could be that he doesn’t want to continue the tenancy with the tenant or now wishes to use the rental space for personal purposes or has found another suitable tenant. Whatever be the reason here, such notice templates are offered to inform the tenant in advance so that he gets enough time to arrange for his new residency. 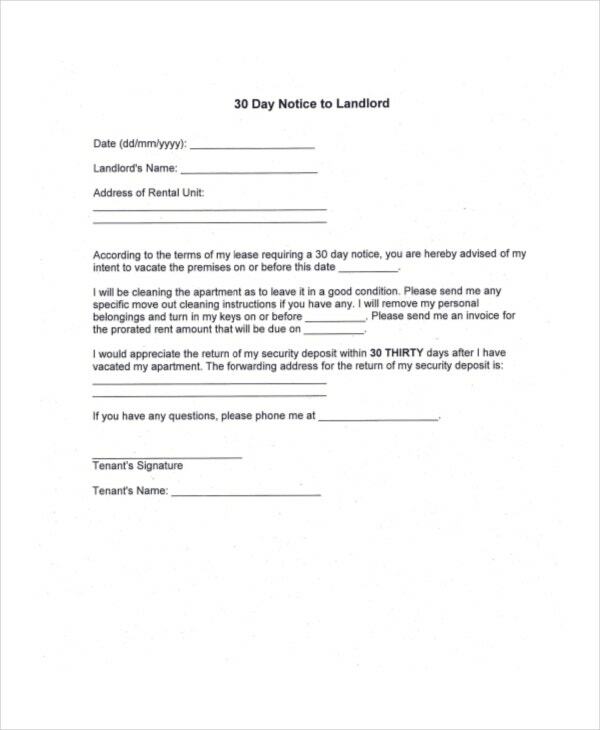 This 30-Day Notice template is sent by a landlord to a tenant regarding a month-to-month lease termination. 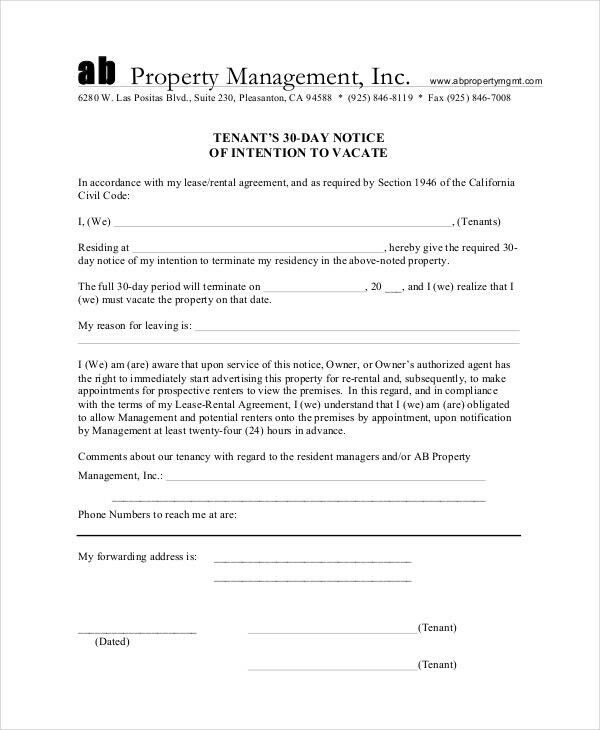 The document mentions the tenancy details and also the reason for termination. 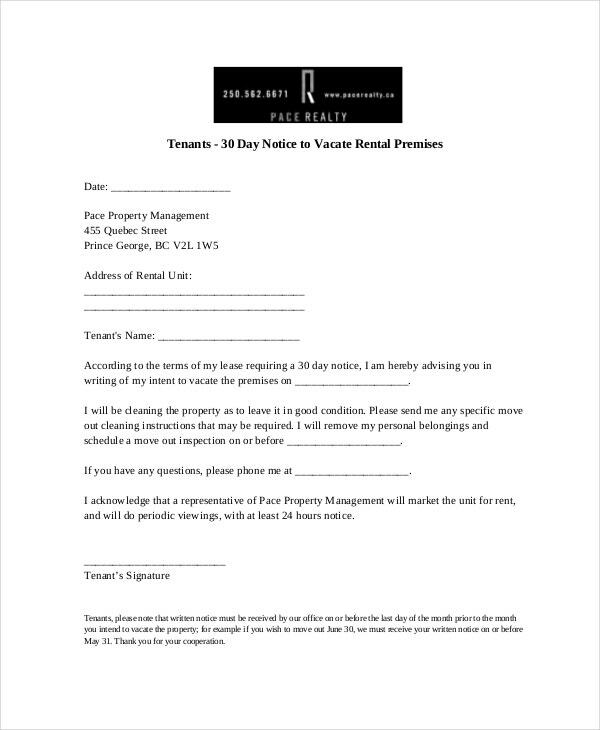 This Notice to Vacate Template goes from a tenant to the landlord and states the date of vacating the property as well as details about inspection and move-out. There is also space for reason for leaving. 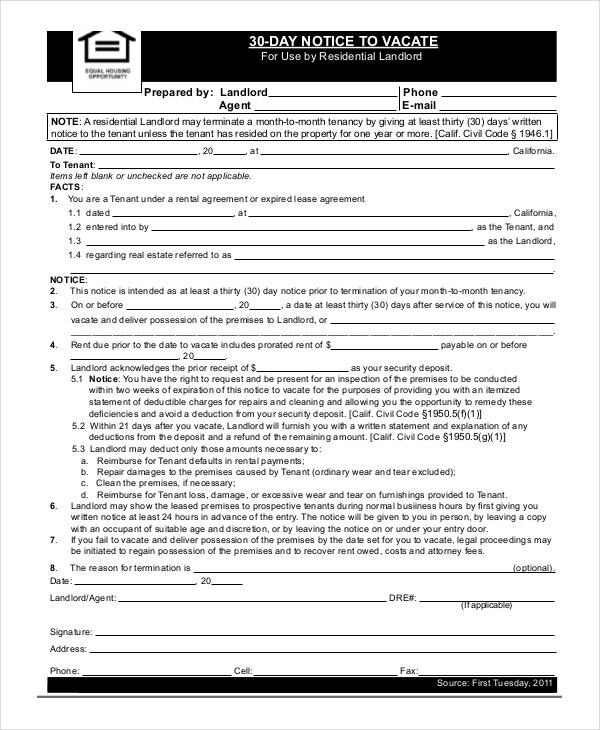 You have an elaborate month to month rental agreement here which starts with details about the rental lease followed by information on each of the major aspects of the agreement- like rent, items permitted, deposits, etc. > What is the Purpose of a 30-Day Notice? The main purpose of a 30-day notice is to inform the tenant that he is supposed to move out of the rented property within a certain date. As the notice is released a month before the actual move-out date, it gives a good amount of time to the tenant to look for another suitable property and make preparations for the move-out. Such a notice may also be provided by tenant to the landlord when the former has found another suitable property and have to move out. This way, the landlord too finds sufficient time to advertise the property for another tenant. 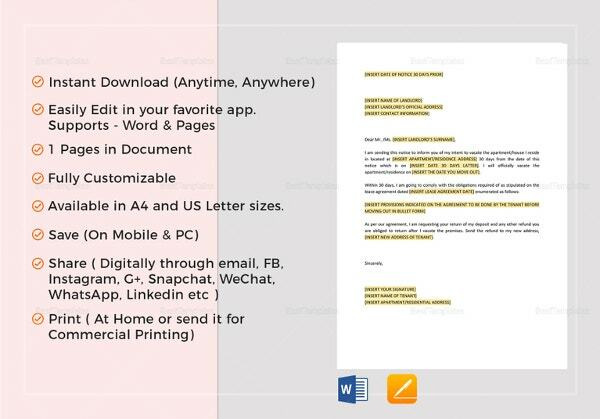 You can also see Notice Period Letters. 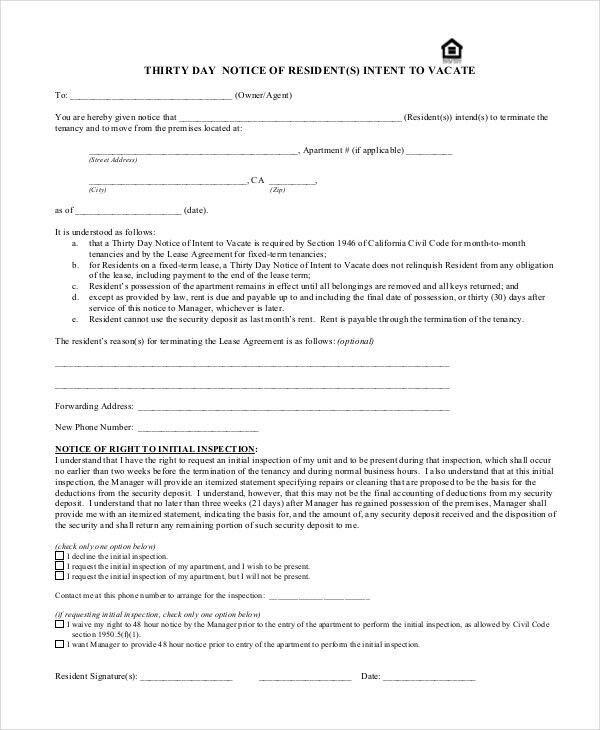 You have a professional 30-day Notice Period Letter which is to be sent by the tenant to the landlord stating that the former is about to vacate the property and the date of move-out is also mentioned here. 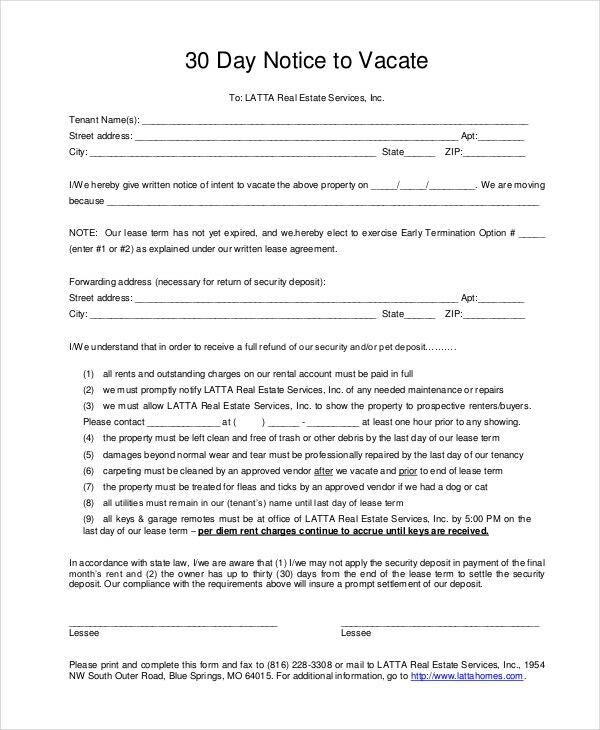 You have a professional Eviction Notice template here that is to be sent by the landlord to tenant asking the latter to move out within a certain date. The template also includes instructions to be followed by tenant before moving out. 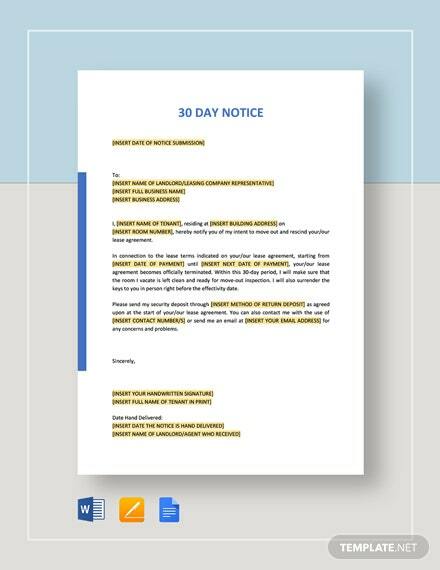 > What constitutes a 30-day notice? A 30-day notice primarily involves the information to vacate the premise and mentions the date from which the lease termination takes effect. It also mentions the name of the landlord and tenant and some notice documents even offer details of the property on lease. 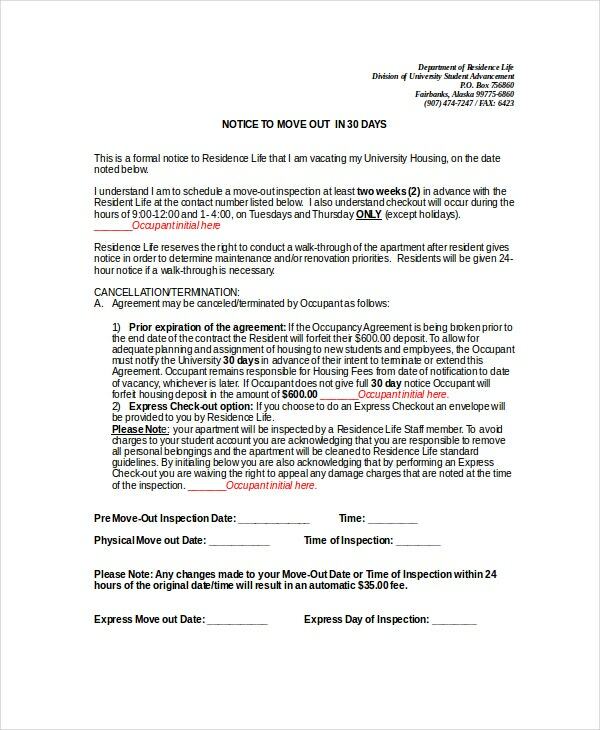 Besides, the more elaborate documents come up with instructions for the tenant to follow before he moves out- such as leaving the property clean and just the way it was received when the tenant had entered the lease agreement. 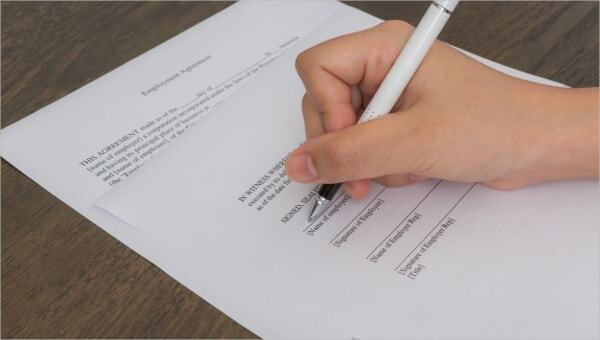 Sometimes, the reason of lease termination is also mentioned by the landlord. 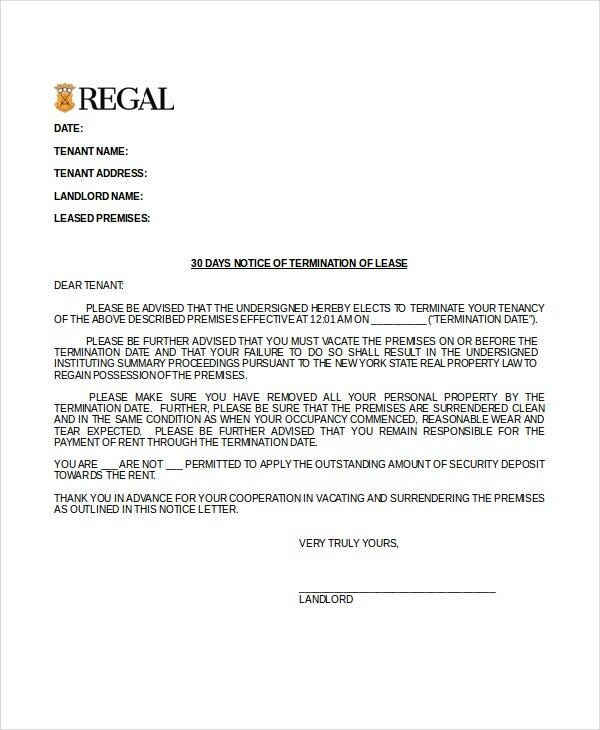 If the tenant is sending the notice, even he too can mention the reason to vacate the property. You can also see Tenacy Notice Templates. 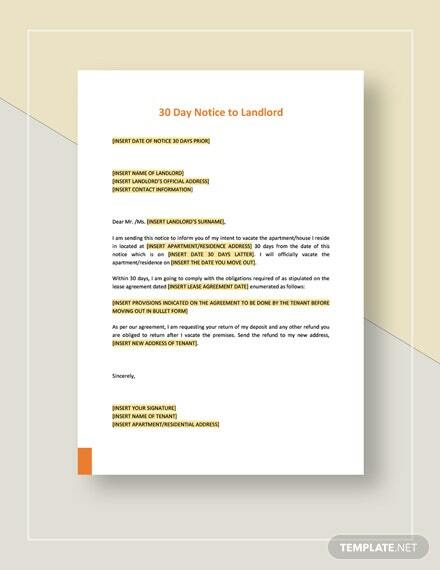 Are you about to send a 30-day notice to your landlord or tenant and looking for ideas on such a notice letter? 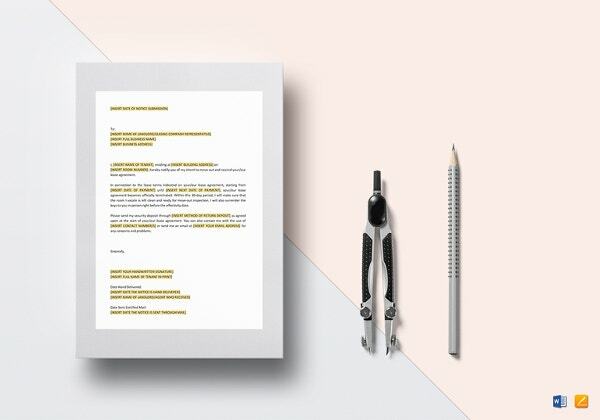 Well, in that case, the templates mentioned above would be really handy for you as they are all drafted by experts and come in a ready-made customizable 30-day notice format. How Do I Formally Resign from a Job?